Our small party of amateur nature explorers emerges from our vehicles, and we take our first steps onto the asphalt that is Explosives Road. The cracked and faded blacktop cuts across the landscape in a long, straight line towards the horizon, devoid of any other souls or engines. 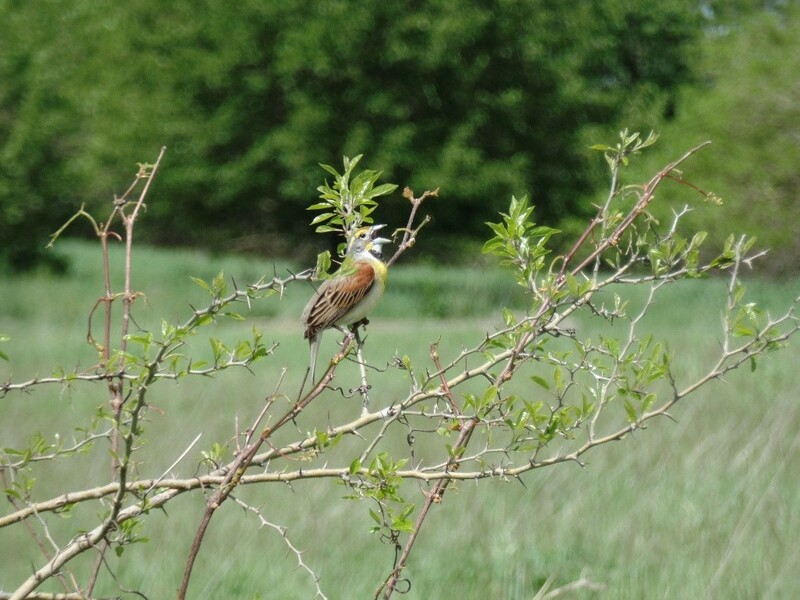 We are surrounded by a grassland, marked here and there by woody edges, and the occasional dickcissel-topped shrub. Despite this impressive expanse of green, it is the sun I am most aware of. It is intensified over the open land; brilliant light and thermal rays the dominant features of this place. My cotton undershirt is a bit moist from the perspiration at my lower back, and I count it a blessing as a late spring breeze rises and falls, cooling the hot-from-the-dryer feel of my denim pants. In all actuality, the weather is quite pleasant, but we, a mixed assemblage of city-dwellers and suburbanites, have grossly overdressed ourselves in protection against ticks, chiggers, poison ivy, and sunburn. On this day, we willingly brave such unchecked hazards of the natural Midwestern environment. We have traveled here deliberately to find that historically definitive and near-extinct feature of Illinois geography: the prairie. A name like Explosives Road inside the Midewin National Tallgrass Prairie seems paradoxical. Its weathered pavement and weed-filled fractures lend the lonely road a post-apocalyptic quality, set amidst fields enlivened by birdsong and wildflowers. Indeed, the name is a ghostly reminder of the land’s past, when it was the location of a U.S. Army munitions plant from World War II through the Cold War. Now, several large parcels of the old Joliet Army Ammunitions Plant (JOAAP) property comprises today’s Midewin. Hiking into the brushy field, I turn my gaze westward and catch a glimpse of odd mounded shapes in the far distance, like gigantic grass covered molehills. These are the 1940s “igloos,” formerly used to store TNT and sturdy enough to hold an explosion, should an accident occur. Therein lies the namesake of this old road. Four days earlier our little group of student explorers had set out into Chicago’s Millennium Park to observe urban nature. We bypass the ever popular Bean sculpture, and stop to take in the view of the Jay Pritzker Pavilion’s Great Lawn, empty on a weekday morning, but still a great photo-op. Beyond these busy parts is the Lurie Garden, partially walled off by tall, dense hedges. They effectively mute out much of the bustle and noise of the rest of the park, proof that trees are great sound barriers! Stepping through the entryway to the garden is teleportation to a peaceful, five-acre refuge from downtown. Instantly, the air is quieter, chatter is hushed; the faces of passersby are contemplative and receptive. To our right are flowers and grasses planted in large raised beds. Our professor points out that most of the plants here are native to the region and prairie ecosystem; however, there are also exotics, like tulips, which have been included – a colorful reminder that, like most examples of urban nature, this landscape is manmade. Nature writer and Sustainable Communities professor Tim Beatley contemplates the importance of natural areas within the urban environment in his article, “Celebrating the Wilderness Act of 1964—and Celebrating Wildness in Cities”. He writes, “We know that we need that connection, that contact with nature, not just during an occasional holiday or summer vacation, but we need it daily or hourly” (para 7). 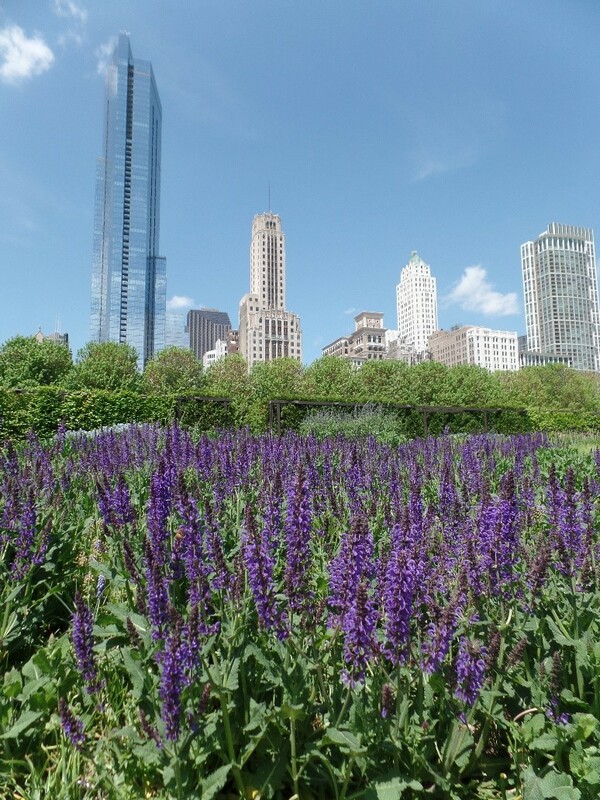 Lurie Garden is a place where downtown Chicagoans can do just that. Beatley also argues that wilderness and cities can and should overlap each other. Within his article is a list titled “What Are the Qualities of Urban Wildness?”, filled with words like “spontaneous”, “unknowability”, and “danger” (para 13). None of these words come to mind when thinking about Lurie Garden, though. On the contrary, I would describe the nature there as arranged, inviting, and safe. A better fit for Beatley’s list can be found at the Montrose Point Bird Sanctuary near Chicago’s Uptown. There is much more of a “nature preserve” feel to this place. The foliage is unkempt and overgrown. Narrow dirt paths meander through the site, eventually leading out to the Lake Michigan shoreline. At Lurie Gardens, one can let down his or her guard; inside the Montrose Point Bird Sanctuary, there is a presiding air of wildness which automatically turns on one’s sixth sense. There are places to hide here, there are twists and turns in the paths that keep visitors guessing, there are fewer people around. Someone could get away with something. Walking through the sanctuary is to be overwhelmed by birds from all walks of life. They swirl endlessly overhead, they are perched in the trees, they are hidden in the leaves. At ground level, “birds of a feather” does not apply, as species step over one another, pecking at the dirt. As part of a major wildlife migration corridor, Montrose Point is proof of wilderness within the city. I agree with Beatley that wildness has a place inside our cities, that people and nature must not be separated. I also hold a deep appreciation, though, for those remote and untamed protected lands, the segregated ones. The Midewin National Tallgrass Prairie strikes me as a balance of these two concepts. Midewin is the largest contiguous open space located within the Chicago metropolitan area, albeit in the far southwest reaches. It is far enough away to be considered “the sticks,” yet within sight of civilization and industry. There are restoration efforts underway to return this land – more than 20,000 acres — to its condition prior to Euro-American settlement. Last month, a small herd of bison was re-introduced to the prairie as part of its restoration process. (This could never happen inside Lurie Garden’s raised beds of decorative prairie.) Bringing back the bison to the Illinois prairie is a monumental step, and will ultimately lessen the burden for restoration workers. To apply Aldo Leopold’s (1949) own words in his landmark essay, “The Land Ethic,” this kind of progression “changes the role of Homo sapiens from conqueror of the land-community to plain member and citizen of it” (p. 240). Coincidentally, right around the time the JOAAP (originally called the Elwood Ordinance Plant and the Kankakee Ordinance Works) was being opened for operation, Leopold was contemplating the ideas that would be articulated in “The Land Ethic.” He often referred to land as a “community,”as made up of many interacting parts (Leopold, 1949, p. 239). This ecocentric view honors the intrinsic value of all the Earth’s elements and inhabitants. We have long been treating land as a commodity to be bought, sold, and exploited for economic gain, and now it is in our hands to address the consequences. Humans have found themselves in a curious position of constantly looking after and managing the world’s natural places, both large and small. More than seventy years after the JOAAP began munitions production, and two hundred years since Euro-American settlement, a land ethic worthy of Leopold’s vision is finally taking shape at Midewin. Truly, that Midewin exists at all is a miracle. During the 1990s, the decommissioned JOAAP became an EPA Superfund site. A massive cleanup project included the removal of unexploded ordinance; soils contaminated with lead, arsenic, TNT, and PCBs; a “Red Water Area,” named for the lagoon and storage tanks which held contaminated water; and “Flashing Grounds,” which were used for burning off explosive residue (U.S. EPA, 2014). As it could be expected, the successful cleanup signaled the prospect of real estate development. Pieces of the property have been variously repurposed to a large-scale intermodal industrial park, the Prairie View Landfill, the Abraham Lincoln National Cemetery, as well as Midewin. Thanks to the Illinois Land Conservation Act of 1995, and the hard work and political advocacy of forward-thinking people, the opportunity to return ecological integrity to some of this land was put into action. How do we begin to correct a couple centuries’ worth of ecological degradation of the land? The folks at Midewin know that they have undertaken a cost-intensive and long-term project, requiring countless man hours. Non-native species have made themselves right at home in the landscape; invasive plants like Japanese honeysuckle and buckthorn, which put out their green leaves early in the spring, make life near impossible for the native vegetation beneath them. I have no qualms in removing these fierce competitors from the North American environment. 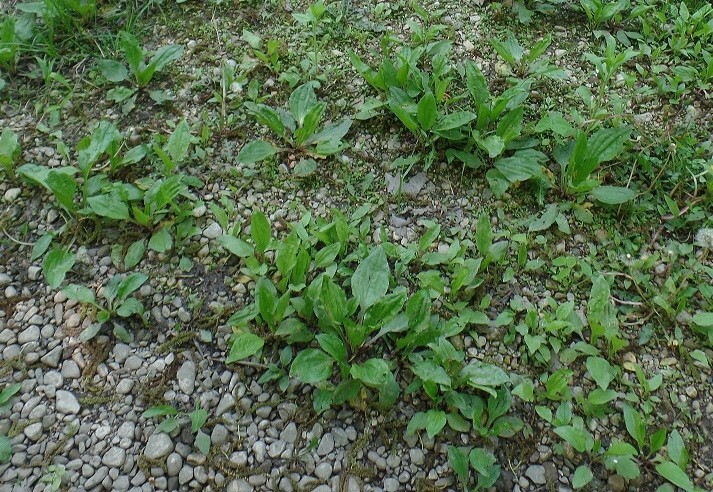 Yet, in spite of my best wishes for a fully restored ecosystem, there is one invasive plant that I have developed an unlikely fondness for, and that is Plantago major. Plantago — also known as plantain or fleawort, and I’ve even heard of the term “Englishman’s foot” – is persistent and weedy, yet actually a diamond in the rough. It grows in your yard, along sidewalks and streets, and certainly at the edges of hiking trails; it seems to prefer areas of heavy foot-traffic. The weed was first identified to me five years ago as a medicinal plant. The leaves may be eaten, or applied directly to wounds, and the seed husks are used widely in fiber supplements. Considering the ubiquity and tenacity of Plantago, I have no doubt that it is here to stay, at least in our lifetimes. I, myself, have chosen to embrace this little exotic, for it has some admirable qualities, being small but mighty, humble yet curative. Hopefully, while it continues its existence here, it won’t cause too much interference within the native ecosystem. Today’s vision for the land at Midewin embraces philosophies both ancient and progressive, with an ideology predating Euro-American settlement and the concept of private ownership, as well as the ethos of the modern-day sustainability movement. I have come across two Midewin slogans which represent this. The first is printed on the trail map, simple and sweet, but with lasting intentions: “a gift to future generations”. The second is on the Forest Service’s Midewin webpage, which reads, “Where people and the prairie restore each other”. The latter slogan is pondered by Gavin Van Horn in his article, “A Reunion of Bison and Tallgrass”. A nature writer, and the Director of Cultures and Conservation for the Center for Humans and Nature, Van Horn poses the question of “how do [the people and prairie] restore each other?” (para 24). The loaded catchphrase suggests that nature and mankind may share a harmonious, mutualistic relationship – an unconventional sentiment in our anthropocentric society. Our human- and economically-centered attitudes towards the Earth are what diminished Illinois’ tallgrass prairies from 21 million acres to less than one tenth of one percent of that number (USDA Forest Service, n.d.). What remains is spotty. Clearly, the prairie is in dire need of restoration, but “Where people and the prairie restore each other” implies that we humans need a special kind of healing, too. I imagine that most folks would consult their family physicians or religious mentors before visiting the prairie in matters of health and well-being. Perhaps the illnesses which result from our over-stressed, over-scheduled, rat-race lifestyles would be better addressed by the quietude found in the natural world. An ancient notion, yet one that is gaining newfound recognition in this digitalized age, is that nature is therapeutic. In fact, indigenous cultures often regarded medicine, spirituality, and nature as intertwined parts of a whole. Van Horn explains that the name Midewin “was adopted from the ritual curing societies that played an important role in Ojibwe, Ottawa, Chippewa, and Potawatomi cultures (the Potawatomi root of the word, Mide’, indicates something ‘mystically powerful’)” (para 23). The Potawatomi name resonates with the hopes and objectives of returning the land to a close resemblance of its original state, in light of its past industrial uses. Although I have lived in Joliet almost my entire life, just a twenty minute drive from Midewin, today’s field trip marks my first visit. I am excited to be here, for the sake of exploring this wilderness, but also, on a much more personal level, for my family history. The history of this property and my own lineage coincide with each other. In January of 1945, my grandmother, Ann (Hannis) Furto, relocated from Michigan to Joliet in search of a job opportunity. Soon thereafter, she was hired on at the Elwood Ordinance Plant as a “Government Inspector,” working there until the end of World War II. When I asked my grandmother, now 93, about her employment during the war, she laughingly replied, “I was a G.I. !” All kidding aside, though, her responsibilities at the plant were rather mundane. She explained that she kept a paper tab for recording dates and numbers, and collected samples of cooled explosive substances from newly manufactured bombs as they moved down the skids. After provoking her memory with a few more earnest questions, it became apparent to me, from her lack of enthusiasm, that her experience at the plant was not particularly impressive. “I didn’t do much,” she remarked, shrugging. I got the feeling that the punny job title was her favorite part of the gig. It was factory work, after all. The closest my grandmother ever came to excitement during her brief career at the old arsenal occurred when one of the bomb’s tops wouldn’t screw off easily. “So I tapped at it with my pen to loosen the cap,” she recalls, with a shade of embarrassment in her voice, “Didn’t realize that I could’ve caused a spark…” (A. Furto, personal communication, May 23, 2015). My grandmother did what her generation was called to do. Her experience with this evolving piece of land, despite having taken place during a destructive chapter in Midewin’s history, is nevertheless significant. She has become a part of this place’s permanent history. And even though my dear grandmother’s role was not particularly glamorous, or even remarkable, because of her, I felt a connection to the land in and around Midewin before ever stepping foot on its soil. I also hold concern and affection for this place simply because the Prairie State is my home, and as a resident, I feel a sense of responsibility. While the restoration process is far from complete at Midewin, the past few decades have seen a toxics-laden Superfund site transform into a thriving suburban wilderness. The generations of today and tomorrow have been called upon to resurrect our tallgrass prairie. Leopold, A. (1949). A Sand County almanac: With essays on conservation from Round River. New York: Ballantine Books.